Ironsworn Lodestar is your quick reference guide for the Ironsworn tabletop roleplaying game. It includes the essential rules, moves, and oracles. It's everything you need to keep your story moving. This product is offered Pay What You Want. This means the PDF can be downloaded at no cost and the print version can be purchased for a price as low as the actual cost of production (currently about US$3.50). 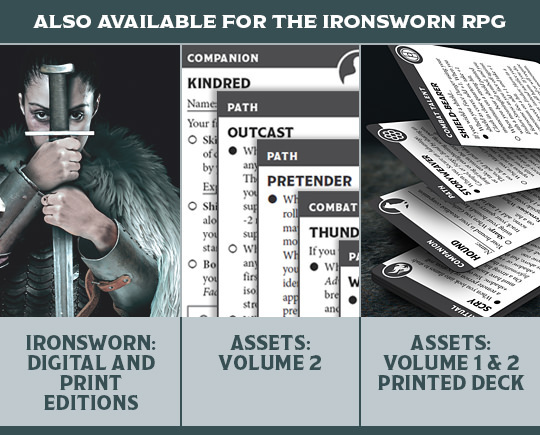 You can set your own price over these minimum amounts to show your support and encourage continued development of the Ironsworn system. Consider this your Ironsworn tip jar. I really appreciate your support! If you are running a convention game and want multiple print copies as player handouts, or if you have limited ability to pay because of financial hardship, please make your purchase at the absolute minimum. The print version shows as "color" in the product summary, but the interior of this product is actually black and white. The color printing process is used for heavier paper and improved image quality. Ironsworn Lodestar is letter-sized (8.5x11), 34 pages, heavyweight 70# matte paper, glossy color cover, and black and white interiors. Ironsworn is the free tabletop roleplaying game of perilous quests for solo, co-op, and guided play. Visit the Ironsworn product page to learn more. The best Lite edition I've ever seen. Why? Because it cuts out what a guy doesn't need while keeping all the neccesary bits that you need at the table. 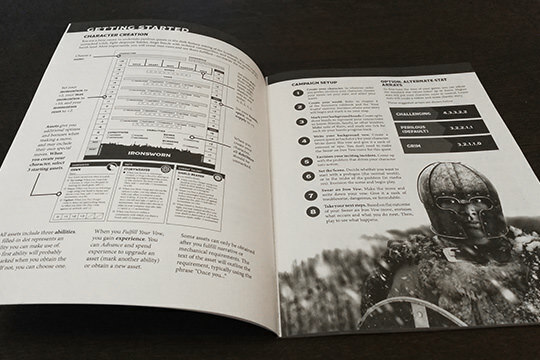 I used pdftopocketmod on this, and I have the pdf version of the full rulebook on my computer for if I need it. So far, haven't even pulled it up. EDIT: Please be sure to have a Lodestar edition of Delve and Sanctuary, if you would. That's great to hear, Jeff. Thanks! 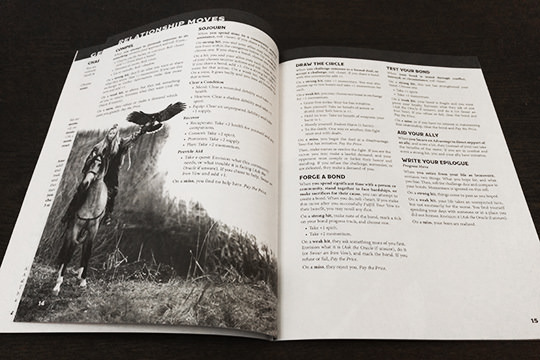 Is the Lodestar book a supplement or more of a quick start rules guide (like the description sounds) and thus uneccessary if you have the core rulebook? Yes, it's intended as a table reference and is mostly material from the core rulebook. There is a couple of extra bits that might be worth the download for you (an additional oracle and an option for alternate stat arrays). Feel free to grab it at zero cost. You can also watch the video linked above, which goes over the purpose and content. Thanks! Hi Shawn, I just noticed that the PDF + Softcover suggested price remains at $2.50 instead of $7.50 like the Softcover alone shows. Thanks for calling that to my attention. There seems to be a bit of a bug, since that option will retain either the $2.50 or the $7.50 depending on what you clicked on previously. I'll ping the DriveThru folks.